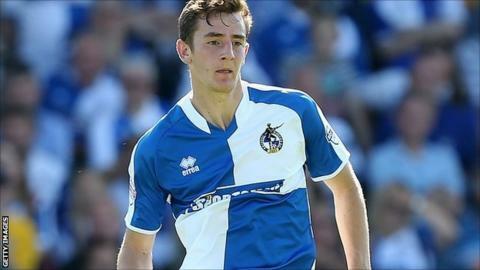 Bristol Rovers midfielder Stuart Sinclair believes team mate Tom Lockyer is a star of the future after he earned his maiden international call-up. Defender Lockyer was named in Wales' Under-21 squad for the first time. And Sinclair was delighted for the 20-year-old, saying it was fully deserved for his performances at Rovers. "It's excellent, awesome for Locks," Sinclair told BBC Bristol. "He works so hard and he's probably one of the most deserving people to have that." As a result of Lockyer plus Jake Gosling (Gibraltar) and Ellis Harrison (Wales Under-21) being on international duty, the Rovers fixture with Wycombe Wanderers has been postponed. Lockyer came through the club's academy and after making his debut in 2012 has made over 100 appearances for Rovers. "He is a fantastic player with a fantastic attitude," added Sinclair. "Personally I think he will play at a really high level so it's awesome for him."